Whale watching Bellingham is great. Bellingham is north of Seattle, and just north of Anacortes, another popular whale watching destination. Just next to Vancouver Island, it is in the waters that are frequented by different species of whales. The most common whales are minke whales and killer whales, which stay here all year around. 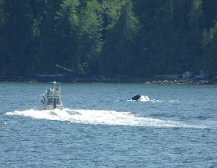 The migrating gray whales are most often seen on the other side of the Vancouver Island, but occasionally venture into the Strait of Juan de Fuca and can be spotted outside Bellingham. There are tour operators that can take you out to the waters to see these amazing animals.